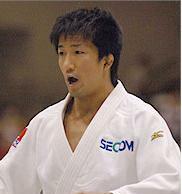 Konan’s Shintaro Nakano Clinic drew close to 50 participants on June 11/12 at Saito Dojo. We had participants from Chicago, Indiana, Canada and across the state and it was a great opportunity to practice against new people, learn from a top-notch clinician and enjoy some comraderie as well. Thanks to Nakano-sensei for sharing his time and skills, JAM for sponsoring some scholarships for athletes and Saito Dojo for hosting. Keep watch on the Konan-JAM website for another clinic in September featuring Michael Eldred, current US national champion and international competitor. This entry was posted on June 13, 2011 at 5:29 am and is filed under Coaching & Teaching, Judo Clinics. You can follow any responses to this entry through the RSS 2.0 feed. You can leave a response, or trackback from your own site.